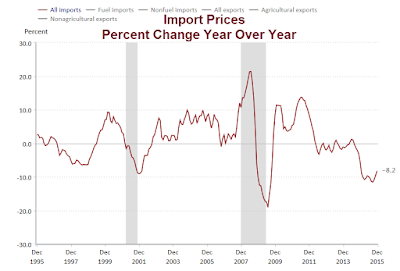 Export and import prices continued the collapse today according to the latest BLS Data. Export prices fell 1.1%, over double the Econoday consensus estimate of -0.5% and also below the lowest economist's forecast of -0.8%. Import prices sank 1.2% less than the consensus estimate of -1.4%. Cross-border price pressures continue to sink into deep contraction, down a month-to-month 1.2 percent for December import prices and down 1.1 percent for export prices. Falling petroleum prices, down a monthly 10.0 percent on the import side, are responsible for much of the deflationary pressure but not all of it as prices for non-fuel imports, down 0.3 percent in the month, are showing their weakest year-on-year pressure, at minus 3.4 percent, since 2001. 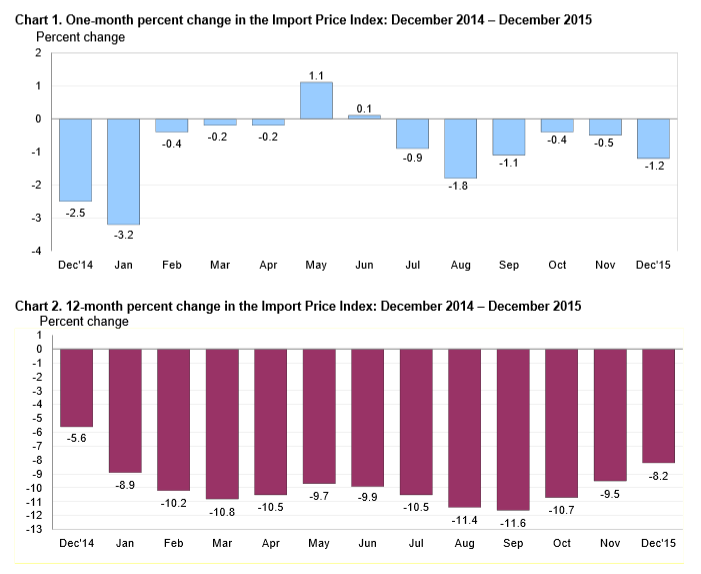 Year-on-year, total import prices for 2015 fell 8.2 percent which is the largest drop since 2008. 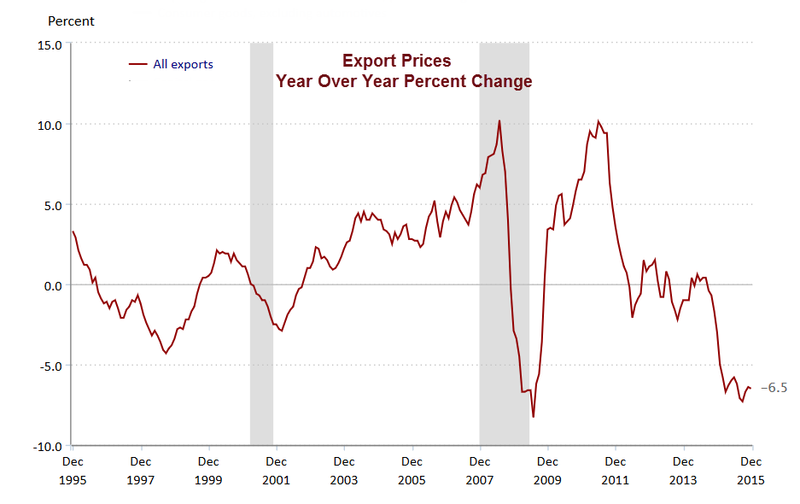 Export prices, down 6.5 percent in 2015, are at a record low for the entire series which goes back to 1989. 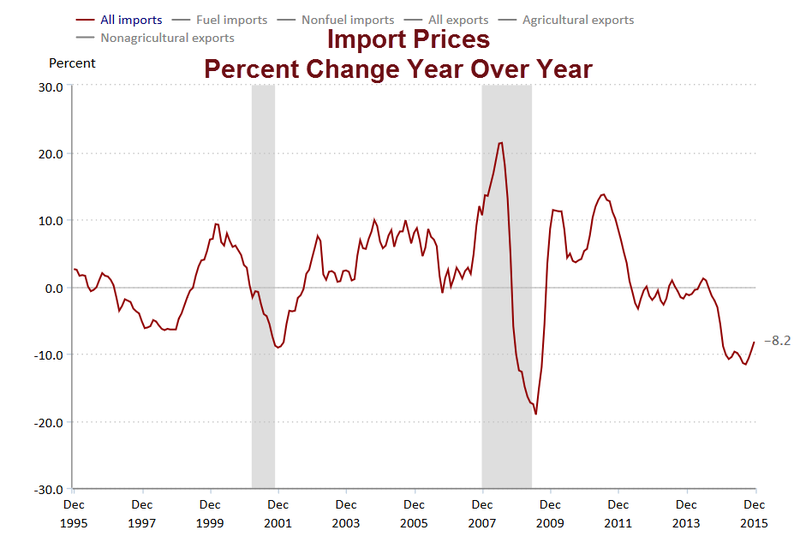 Export prices excluding agriculture, down 5.9 percent, is also a record low. Weakness is spilling into finished goods prices where capital goods imports, down 0.3 percent in the month, are at a year-on-year minus 2.5 percent which is the steepest decline since 2002. Other readings here are also weak including exported consumer goods which are down 0.4 percent in the month and down 2.4 percent on the year. Import prices from Canada, down 2.8 percent in the month for a year-on-year minus 14.8 percent, are the weakest of all and reflect deflation for oil and commodities. 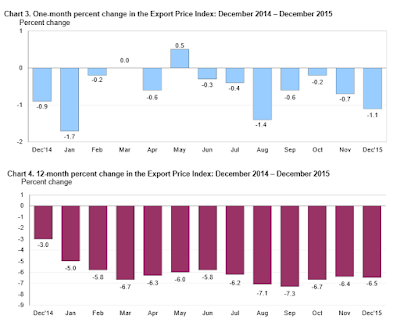 Latin America is next, down 1.5 percent for a year-on-year minus 11.2 percent. China shows the least downward pressure, only 0.1 percent lower in the month and down only 1.7 percent on the year. The unfortunate records in this report won't make for sound sleeping for Federal Reserve policy makers as it frustrates their goal to raise inflation expectations and move prices to their 2 percent target. Watch tomorrow for producer prices and next Wednesday for consumer prices. Outside of recessions, and severe ones at that, we have never seen price collapses of this nature.